Best practices for ensuring top-notch collaboration with your whole team. One of the hallmark features of Trello is that it’s really easy to collaborate and work with others. Whether it’s co-workers, a spouse, or some friends, Trello boards give everyone a shared perspective. You can view everything you need and access all of the information in one place. That’s right: never get lost in an annoying email chain again. You can thank us later. Get everyone on board with a “how-to” card that is easily accessible at the top of the first list on the board. Add goals, timelines, resources, and links to relevant chat channels to this card. It might also be helpful to explain the workflow here. Instantly see what’s not getting done with the Card Aging Power-Up, which sets the color of cards to fade out over time if they haven’t had any activity in a while. Have a dedicated meeting spot accessible on a board with the Google Hangouts or appear.in Power-Ups. Host regular standups with board members so that everyone can share what they’ve done, what they are working on, and anything that’s blocking their work. Leave a comment on a card to provide a status update for your team. This way they know what’s been worked on and won’t have to bother you later. Mention everyone on a card or an entire board with @card and @board, respectively. Be careful with your newfound @ mention powers! Feeling... emojinal?  For times when emoji speaks louder than words, click the 😄 at the bottom of the comment box and let your “voice” be heard. Simply drag the card over to a designated “Done” list. For all the productivity powerhouses who need more than a single done list, break them up by week or month. In a single click, mark cards with due dates as done and let everyone revel in that green symbol of success. For the label lovers out there, apply a “Done” label to a card and move on to the next great thing in the pipeline. #TrelloTips:Make sure that no important due dates get lost on a long list. If a list has cards with due dates, click the list’s menu icon and select “Sort by Date” to surface all of the cards with due dates on them. Here’s a common scenario: You’re the board maestro orchestrating collaborative masterpieces. You always want to be in the know on all the board’s activity so you add yourself to cards left and right. Hold on a minute, Mozart—there’s a better way. The trouble with adding your avatar to cards for which you are not directly responsible is that it could remove the clarity of others having the ability to see in a glance who is working on what. Instead, you may want to try just watching cards to receive all of those same, juicy notifications. 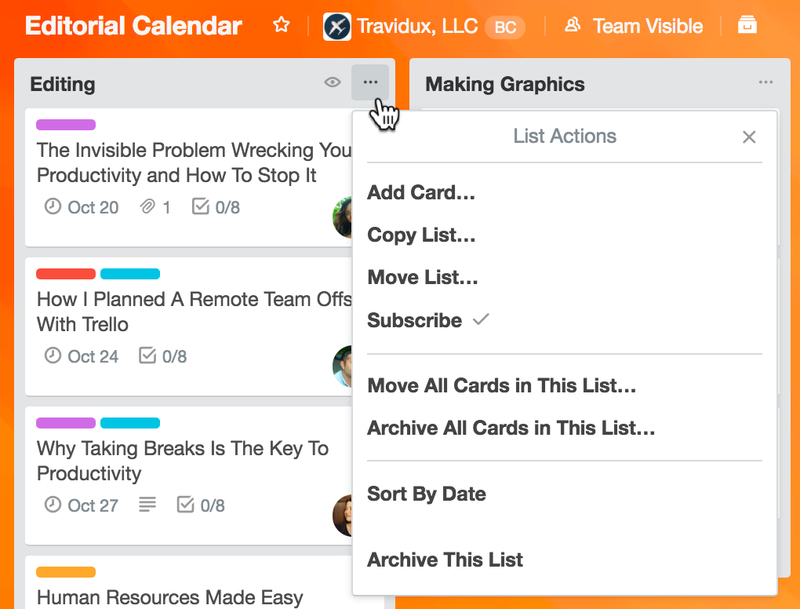 In fact, you can even watch individual lists or an entire Trello board, which can be a real productivity enhancer for some workflows. Managers of a team or a project who want to be notified when tasks are completed can watch the “Done” list on the board. If you are a critical part of a workflow, like a copy editor for a draft or a QA tester on a development team, watch the appropriate list. Sure, you’d expect to be added to the card or mentioned in a comment, but why not have your bases covered? Watch an “Incoming” list if you are in sales and a hot new lead comes in that should be contacted, or if you are in support and there’s a new ticket. Whatever your workflow, use "Watch" to stay informed on what’s most important to you. Make sure that communication across different apps doesn’t become siloed with Power-Ups. Connect the apps and services that you rely on, like Google Drive or Salesforce, to your Trello boards to bring the information you need right into your workflow. 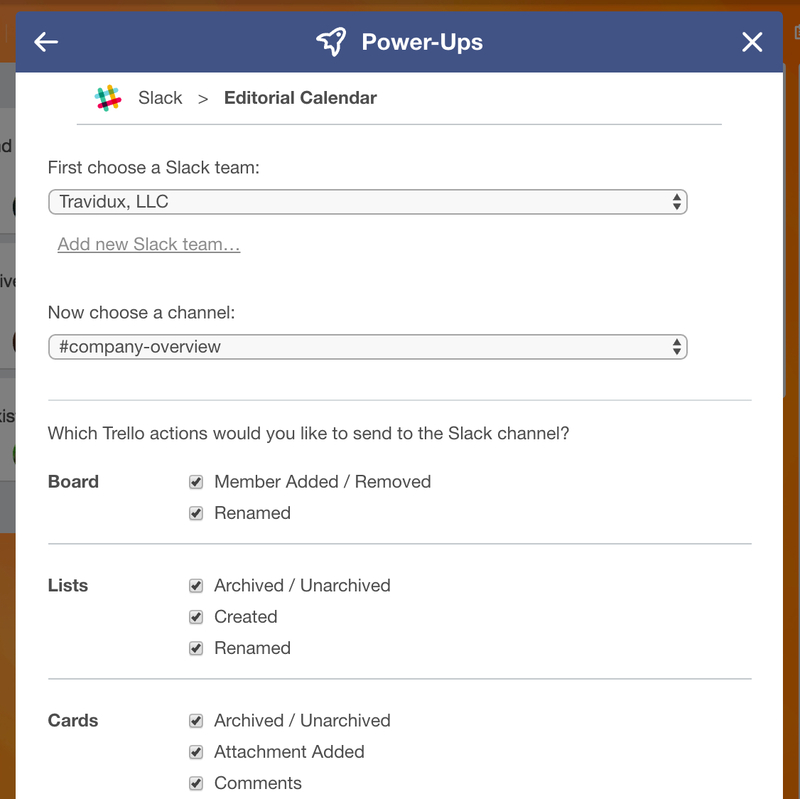 For example, the Slack Power-Up let’s you attach key conversations to Trello cards so that you can turn talk into an action item. Plus, you can also send Trello cards to Slack to kick off a brainstorm session, or get Slack alerts from actions in Trello for the items that matter to your team the most. This not only saves time and prevents context switching, but also turns Trello into your custom productivity hub. There you have it, the keys to the collaboration kingdom. Now it’s time to expand your domain!